A few weeks ago, I was translating material for my friend Jan Petterson whom I met at our armor symposium in Florence. To provide you with some context, Jan is going to write a book about the matchlock history of Yonezawa during the Momoyama and Edo period and visited the very site earlier this year. There he had the chance to get in touch with the local groups and experts and if you want to learn about his awesome trip (with Jan himself actively participating in the annual teppô events), I would highly recommend to register with The Samurai Armour Forum and check out the thread labeled “The viking raid of 2016!” Great read! Now as Jan is writing his book, I am not going into too much detail here but in one of the relevant source texts, I came across a kind of funny story that I want to share with my readers (Jan is in the loop). To provide some background, the Uesugi (上杉), the daimyô of the Yonezawa fief (米沢藩), were early adopters of the teppô as one of their famous ancestors, Uesugi Kenshin (上杉謙信, 1530-1578), was among the then powerful Sengoku daimyô who recognized the powerful potential of this new weapon. Uesugi Kagekatsu (上杉景勝, 1556-1623), Kenshin’s successor, was actually the first of the family to enter Yonezawa and he too focused very much on having firearms incorporated into his army, much supported by his retainer and confidant Naoe Kanetsugu (直江兼続, 1559-1620). So they hired gunsmiths and shooting instructors and all that stuff and had teppô drills pushed and production sites established on their lands. Kanetsugu by the way compiled a 15-article teppô practice curriculum, the so-called Teppô Keiko Sadame (鉄砲稽古定), which interestingly pretty much grasps all the relevant gun safety issues in effect today. About a decade after the Ôsaka campaigns of 1614/15 and when everything had calmed down, Kagekatsu’s successor Uesugi Sadakatsu (上杉定勝, 1604-1645) was facing his share to rule of the fief and introduced an event called teppô-jôran (鉄砲上覧) which was an biennial demonstration of all matchlock, hand cannon, and cannon using troops that was witnessed by the daimyô. The teppô-jôran was of course a big thing for the local bushi and a great honor and practice motivation for all participating units. But as more and more importance was attached to that event over the years, an honorable demonstration of skill turned into a dispute between two units about who makes the start. As some of you might know, who is first has ever been a very important issue among samurai armies, i.e. those guys who were leading a vanguard and be the first into battle were usually the ones who entered the history books. So this dispute has to be seen in this context. Now the fight was between the two units of the o-umamawari-gumi (御馬廻組) and the gojûki-gumi (五十騎組), the former going back to the 100 mounted warriors that were once chosen by Uesugi Kenshin to form his (banner-bearing) elite guard, and the latter to the mounted hatamoto group of 50 which was carefully selected by Uesugi Kagekatsu from his highest ranking and most bemedaled retainers. In short, both units were standing relatively high within the Yonezawa army hierarchy and belonged to the so-called san-tegumi (三手組), a military organizational group within the retainer structure of Yonezawa with the Yoita-gumi (与板組, an infantry unit) being the third party. Stumbling block for the whole “who comes first at the teppô inspection” dispute was the Kan’ei four (1627) inspection when the gojûki-gumi was about to make the start depite the fact that the o-umamawari-gumi‘s name was on top of the (written) san-tegumi list. So that record was taken literally. The gojûki-gumi however pointed out that it had been in the vanguard at the Ôsaka Winter Campaign and so it was eventually decided in favor of this unit making the start and that the two groups start from now on alternatingly. Well, things heated up again when it came to who performs first at a teppô-jôran after a hatsu-nyûbu (初入部). A hatsu-nyûbu was when the Yonezawa daimyô visited his fief for the first time, i.e. having been raised and living in the Edo mansion of the fief until the succession. So performing first at the first teppô inspection of a newly inaugurated daimyô was even a greater honor for these units. The hatsu-nyûbu thing came up when the sixth Yonezawa daimyô Uesugi Munenori (上杉宗憲, 1714-1734) entered Yonezawa in Kyôhô eleven (1726) and when it was decided that the o-umamawari-gumi should make the start at the first teppô inspection after a hatsu-nyûbu. The gojûki-gumi protested as they had that honor at the last and second last first inspection after a new lord had been appointed. In short, the agreement on the alternating performance was jeopardized by making the first event after a hatsu-nyûbu so special. 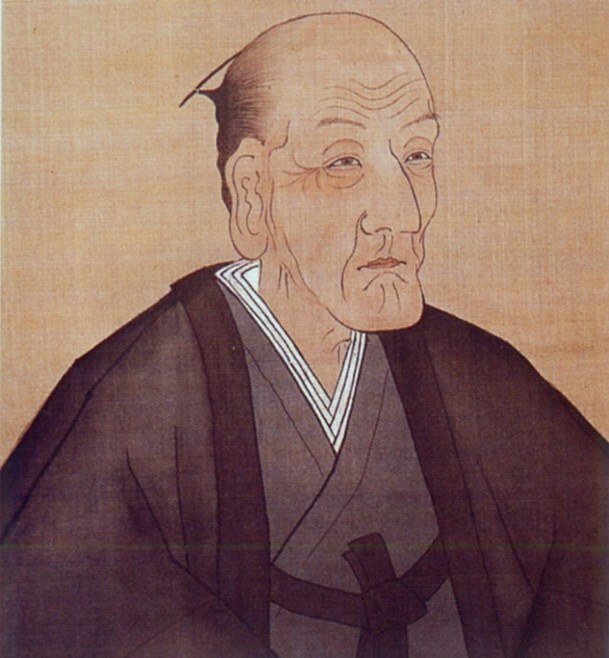 The dispute flared up again when Uesugi Harunori (上杉治憲, 1751-1822), aka Yôzan (鷹山) (see picture above), entered Yonezawa in Meiwa six (1769) and the gojûki-gumi made the start. Now the o-umamawari-gumi emphasized that it had been settled since Munenori that they have that honor at the very first event following a hatsu-nyûbu regardless of whose turn it would be following the alternating order. Yôzan addressed the commanders of each unit and brought all parties to the table but no one gave in and things were escalating, with friends and relatives not wanting to sit next to each other up to having daughters divorced. This whole situation troubled Yôzan very much and he tried again to bring the two units together, also including the Yoita-gumi this time. When they were discussing things Yôzan forwarded that competition is in the nature of a bushi but that they were all still retainers at the end of the day and that they thus have to bear in mind the welfare of the fief as top priority. So more energy should be put into daily teppô practice and a major and long lasting dispute like this has the potential to destroy a fief. With the Yoita-gumi mediating, Yôzan was waiting for a response from the two parties. But when the o-umamawari-gumi was objecting many points of the written reply the gojûki-gumi had submitted, Yôzan’s patience was wearing thin and he had the head of the o-umamawari-gumi removed from his post and the head of the supposedly mediating Yôita-gumi placed under house arrest. After that, both parties were requested to submit another written reply and as this time the one from the gojûki-gumi was nothing more than a stubborn copy of their first reply, the fief’s elder recommended Yôzan that nothing will help but to abolish the whole official teppô inspection. Well, Yôzan wanted to give that issue a last try because him not being able to ressolve this issue would on the one hand worsen the discipline of the entire teppô practice, but would be on the other hand always something that will be associated with his name and function as a daimyô for generations to come. So he openly informed the two parties about these considerations. This was effective, both heads resigned and telling their members about their daimyô’s words, the bushi were deeply impressed but also ashamed that it came so far, replying that from now on, the gojûki-gumi should have the honor of making the start and the o-umamawari-gumi will perform second without further hassle. Yôzan expressed his gratitude to the o-umamawari-gumi and put into effect that the gojûki-gumi will henceforth be the unit that opens the official teppô inspection. Homepage of the Yonezawa Han Koshiki Hôjutsu Hozon Kai (米沢藩古式砲術保存会) click here. Videos of the annual event an be found here. Glad to hear, that Jan decided to write this book!